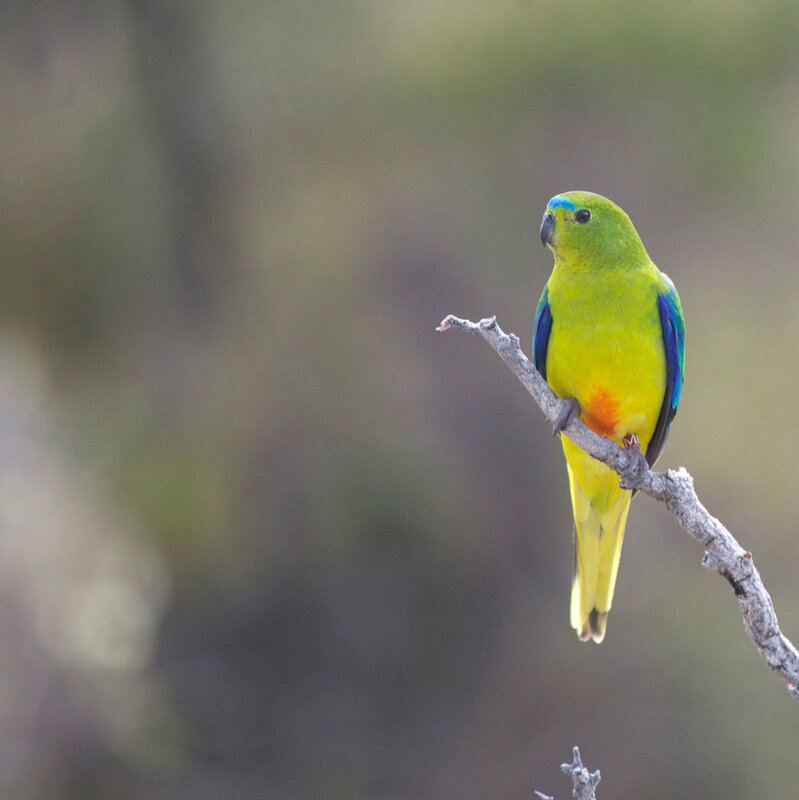 The critically endangered orange-bellied parrots (OBP) is Australia’s most threatened bird. The species is migratory, and breeds in the rugged Tasmanian Southwest World Heritage area before migrating to the southern coastline of mainland Australia for the winter. The species depends on tree cavities for nesting, but these trees must occur near coastal moorland where the herbs and seeds they need for food occur. OBPs use mainland coastal saltmarsh to see out the winter, but such habitats have been dramatically degraded or removed since European settlement. Because the species has been in decline for decades, a captive population was established to act as insurance against extinction. Captive bred birds have been released into the wild for decades, but this has failed to stem the species decline. As at 2016 only 3 wild females and 11 wild males returned to their breeding ground. The Tasmanian Department of Primary Industries, Parks, Water and the Environment (DPIPWE) have monitored OBPs at their last breeding grounds for decades, and we have formed a collaboration with DPIPWE to advance the conservation status of OBPs. The tiny population size of OBP is the biggest problem it now faces. There is also a lot of uncertainty about the causes of their decline. The last breeding ground of the OBP is Melaleuca, in remote and rugged southwest Tasmania. Although magnificent, this location poses major logistic challenges for work, and makes finding OBPs very difficult. Unfortunately, the release of captive bred birds has not recovered the population of OBPs, meaning that additional approaches need to be implemented urgently. Delay or failure to carry out additional management and research to increase the reproductive output of the remaining population, and improve knowledge of threatening processes, could lead to the extinction of orange-bellied parrots. We are researching the level of risk faced by OBPs in their historic breeding range from predation by sugar gliders. Gliders are known to have eaten breeding OBPs at some of their historic locations, and this may have played a role in their decline. However this information is crucial in long term planning for OBP recovery because establishing a second population is a key aim. Deciding where to locate a second population though will be dependent of where OBPs are likely to be safe from predation by sugar gliders. We are surveying historic location where OBPs are known to have bred to identify whether sugar gliders are present/absent at a site, and to evaluate the suitability of historic sites as places to establish another insurance population.